The Elfwegentocht is a two-week-long event in July in which citizens of the province Friesland in the Netherlands will travel fossil-fuel-free. Friesland is the first province to offer 100% renewable diesel at local fuel stations. The renewable diesel is called Blauwe Diesel powered by Neste MY. Blauwe Diesel is a sustainable and renewable alternative to conventional diesel that cuts greenhouse gas emissions by up to 90% and enables reductions in engine-out emissions. “We are delighted to be part of the Fossil-Free Friesland movement, and to support the Elfwegentocht event in reaching its fossil-free targets. 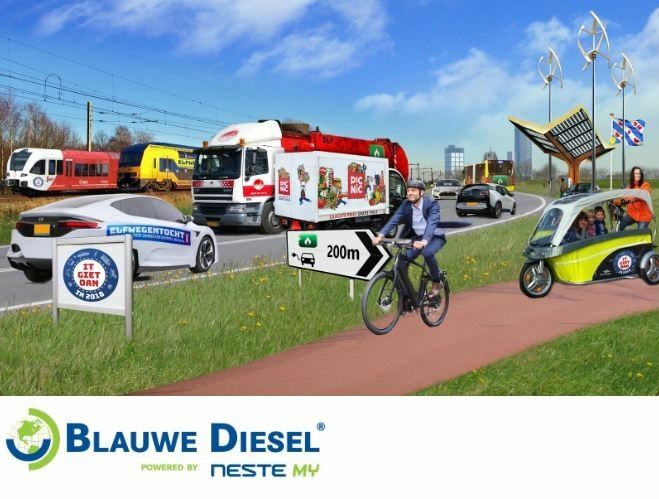 With our local distributor Future Fuels Wholesale, we are introducing Blauwe Diesel powered by Neste MY in the Dutch market”, says Peter Zonneveld, Vice President of Sales at Neste. "We have been eagerly waiting for Blauwe Diesel to be sold at fuel stations in Friesland. It is a fossil-free solution we were missing. Now all diesel cars can join the fossil-free event, alongside electric, biogas, solar and wind powered vehicles. We are extremely happy to have Neste supporting our event and the fossil-free movement in Friesland", says Bouwe de Boer, leader of the fossil-free movement. Blauwe Diesel powered by Neste MY is a 100% HVO (Hydrotreated Vegetable Oil, classified as Advanced Biofuel), which is produced entirely from renewable and sustainable raw materials, for example in Neste’s Rotterdam refinery. Its chemical composition is comparable to conventional diesel fuel. It behaves just like conventional fossil diesel, so no modifications are needed into the engines or distribution systems. At the time of the Elfwegentocht event, Blauwe Diesel powered by Neste MY will be sold at selected Tamoil, Veenema and Postma fuel stations throughout the Friesland province. Elfwegentocht is the largest sustainable event ever, from 1 to 14 July 2018, setting a new world record. Leeuwarden, the capital of the Friesland province in the Netherlands, is also the Cultural Capital of Europe for 2018… Or should we say Sustainable Capital? The Frisians are proud to show the rest of the world that it is possible to travel fossil-fuel-free for two whole weeks. The roads will be filled with electric cars, cyclists, vehicles powered by biogas, or Blauwe Diesel Powered by Neste MY. The goal is to use no diesel and no petrol!